If your kids are like mine, they love packaged things above fresh things. Why? Well, it seems that children taste foods with their EYES as well as their mouth. I already wrote about the using the power of cartoon characters to push a healthy snack see: DIY Packaging Tricks For Healthy Snacks. Snack Girl got really excited when she saw these new Dole fruit cups in 100% fruit juice. I had reviewed Del Monte Diced Peaches in Light Syrup and was sad there was added sugar in the product. 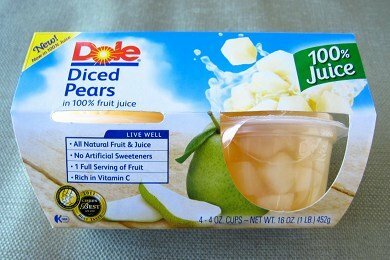 Now, Dole comes out with a product with the diced fruit in fruit juice. Just to be clear, this didn't decrease the overall sugar in the snack. Fruit juice has sugar as well, but it is natural sugar as opposed to refined sugar. It probably doesn't matter that much, but it is less a processed form of sugar and therefore more natural. This snack has no artificial colors, no high fructose corn syrup, and no preservatives other than vitamin C.
I think these are a great option to keep in your pantry for when you run out of fresh fruit. My children also consider these a TREAT, and they are way better for them then many other packaged snacks. When I wrote about Del Monte Diced Peaches in Light Syrup, the first commenter brought up a study on lead levels in these canned fruits. So, I looked into the research on lead levels in fruits. The reality is that orchards used lead in their pesticides in the 1950's, and we all used to drive cars with LEADED gasoline. The lead got into the soil, and it doesn't degrade. Basically, all fruits or vegetables could have some lead in them. What amount is safe? We don't know. This is a toxin that is in our environment and it is difficult to avoid. The amounts found in these canned fruits were very low. The question I have is what about the benefits of eating fruit? Does that benefit outweigh the potential harm of eating a small amount of lead? It seems that everything we eat has an ethical, chemical, or political issue. My suggestion is to just eat a variety of things so that you don't get dosed on too much of anything. For example, five fruit cups a day is probably too many. Maybe 2 or 3 fruit cups a week is a good amount. Just use common sense. What do you think of Dole Fruit Cups with 100% Fruit Juice? Thanks for letting us know about these new things! I love packaged fruits. They're great to throw in a picnic bag or use as a snack any time in a pinch when you're out of fresh fruit. I love the packed in juice option - yay Dole! The only problem, which is unavoidable, is keeping these things from spilling/squirting as you open them. I do it slowly over my sink to be safe. To send them in a lunch for my 2 and 5 year olds (they go to prek 2x a week), i have to open them ahead of time, drain the liquid, and then reseal them with some press-n-seal or put them in my own container or that little side square of my lovely lunchbox tray from easylunchboxes.com that we use. I give my kids fresh fruit daily, and canned fruit is a great backup when my fresh fruit at home isn't so fresh any more. ;-) And the little containers are great to reuse for dips or crafts or sandbox toys, or refilling with canned or fresh fruit without using your own "good" containers. I still love the little packs of fruit in juice to eat with cottage cheese or greek yogurt as an adult without needing to open a whole can. I love these!!!! !........I usually put one of these into a container with 1/2 cup 1% Cottage Cheese....It's glorious and good for you too!!!!! @sh: It's a 'once in awhile treat' because 1) it isn't as natural as eating an apple off a tree or grapes off a vine, or from a local grocery store in the produce section, and 2) it has fruit juice, which has sugar. Too much sugar = a larger N. America. For woman to safely consume sugar daily, it should be a mere 25g. By the way, don't get the Mandarin Oranges in Gel from Del Monte because it contains artificial colors....I'll get these when it's not pear season and I'm craving some pears! Whole Foods also carries 2 kinds of fruits cup snacks, mixed fruit and just pineapples. Theirs are 100% fruit and no added anything. We love these for a sweet treat. Hey, Snack Girl! I love your site, and this review reminded me of something, another kind of packaged fruit, that I just found. They're called Crunchies, and they're different types of freeze-dried fruit. There is no added sugar or preservatives. Nothing but yummy, crunchy fruit. A serving is 1/4cup for 25 calories, and there are 6 servings in a bag... That's right, you could eat the entire bag for less than 200 calories. So yummy! There are different kinds. I tried the mixed fruit. I have not tried the fruit cups in 100% juice, but I really like the no sugar added fruit cups which are packed in water with Splenda. Just curious, what are your thoughts on those? I purchased the 100% juice pineapple cups for my kids, the truly enjoyed them. I was so happy to see the 100% cups instead of those in syrup. Another thing you could do is buy cans of fruit and then seperate them into individual cups. Here's a nifty tip to decrease sugar intake...i buy the fruit cups packed in 100% juice, peel back the lid a bit and strain out the juice into the sink, then eat the fruit! My babies were obsessed with these fruit cups. They were like kittens with a can of tuna, I swear they would hear me open the package and run right over. LOVED these, but when I opened them at my desk, it squirted all over me - down the front of my shirt, into my bra. Will. NEVER. buy. these. again.